We woke up on Day Two in Nassau, Bahamas! We met up for breakfast and then let the kids play in this activities' area (complete with basketball courts, ping pong, and foosball) before we got off the ship for our excursion to the Atlantis! Foosball is way more fun on a ship, right? A quick stop for instructions before disembarking. Check out Ebby Lee-she's tired of the wait. hahaha! We quickly snagged some prime chairs by the kiddie pool and were off. I have hardly any pictures, because we put our phones/money in a locker. But-check out that kid area behind the bushes. That's as busy as it got. It was AMAZING! There were not many people at all. About four years ago, Tab and I went on a cruise with my cousin and her husband that stopped in Nassau. We went to Atlantis in July and it was BUSY!! The lines for water slides were long and every pool had lots of people. Let me add...it was still crazy nice and fun but it was just busy. Apparently in March the Atlantis is NOT busy! The weather when we first arrived was a little cloudy and not crazy warm, but by the afternoon the sun was out and you could find us all in the lazy river (or CRAZY RIVER-ha! If you've been before, you know what I'm talking about). Before lunch, Shay and I set by the kid pool while the guys rode water slides. All of our kids were a tad too short to ride the big ones. After lunch, it was the Mamas turn!! We hit up the big slides (some without a wait AT ALL!) and had a BLAST! We stopped for a little cookie break and this happened. Bowen had all the fun he could take. haha! We slowly made our way back to the ship. Whew!! Like a drowned rat after a day of water slides, but SO MUCH FUN! 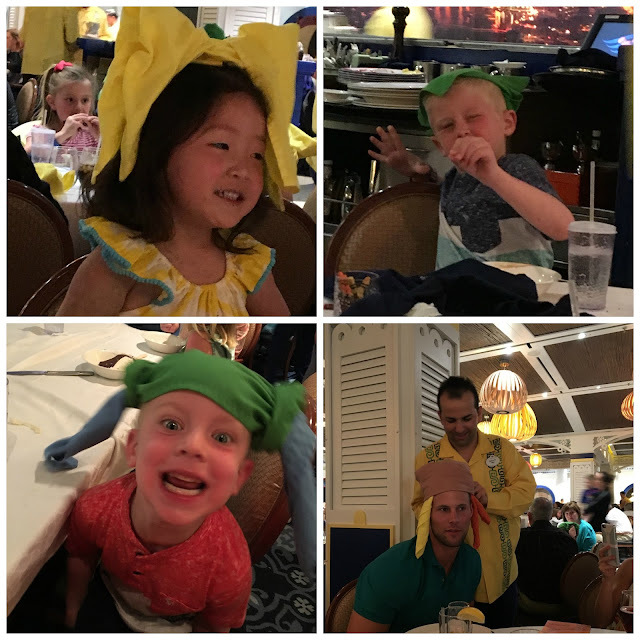 At dinner that night our server gave all the kids some kind of fancy hat and he even included Andrew. My dinner included a truffle ravioli that I'm still thinking about. haha! And our show afterwards was Tangled: The Musical, and it was FABULOUS! My very favorite! If you missed Day One, you can check it out here. The next day we woke up on Castaway Cay, Disney's Private Island! I'll be sharing all the details tomorrow. 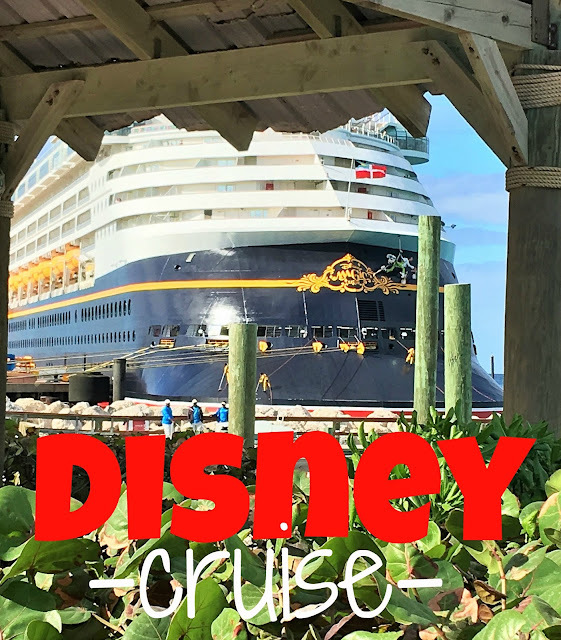 I love disney cruise and it is the BEST! I love seeing all your cute/fun pictures!! What other shows did they play during your cruise? I am excited to see tomorrow's post as well! Thank you for sharing! Cute, cute!! Loving all of these pictures!! Day 2 seemed like so much fun!!!! I'm glad you had a great time at Atlantis! My husband and I are going on a cruise in June and we dock at Nassau one day, so we're going to go to Atlantis, too! Love your cute swimsuit! Where is it from? And the kiddos matching ones? Thanks!!! You guys will have a blast!! That river was the opposite of Lazy AND six kids on tubes is a lot to keep up with!! The crazy river would have given me anxiety with 6 kids!!!!!! So I wonder how many hours of napkin folding all the cruise staff have to take!?! Ha!!! Sheaffer-you have no idea! Luckily the dads were on top of their game because Shay and I could not paddle to a kid fast enough! This resort looks like so much fun! Omg, I would need some anxiety meds for that lazy river!!! So fun!!! Looks like a blast!!!! Awesome day. Did you take your own strollers, or were they available on the ship (or to rent)? It was but yes, we needed some!! Love your sunglasses! Can you link which ones they are? Soooo much fun! I'm loving these posts! Love reading about your trip!!!! And you don't look like a drowned rat, you look awesome!! I would looked a million times worse. Ha!!! Love that black shirt with the colored pattern, where is that from? Where did you get the coordinating suits for your kiddos? Those are so cute! Atlantis is just incredible! We could have stayed there forever when we went!! Time to plan a new trip! Dreaming of a trip to Atlantis!! Love this day! Looks like another fun day! I didn't realize you got to stop at Atlantis, that's really neat! We did Atlantis on our Disney cruise in October. It is CRAZY river!! My girl sat in my lap and laughed the whole time, those deep belly laughs. Did you do the slide that gives you a wedgy? Haha! I'm loving these peeks into your vacation! We sail out on Easter Sunday for the exact same cruise! I am so excited to be seeing and reading all about yours and Shays fun times! I might be emailing with some questions if you don't mind, in the next day or two. Thanks for sharing! Where is your black and neon tank or bathing suit top from? So cute!